"Disclosure: Sponsored by JERGENS® Skincare through their partnership with POPSUGAR Select. 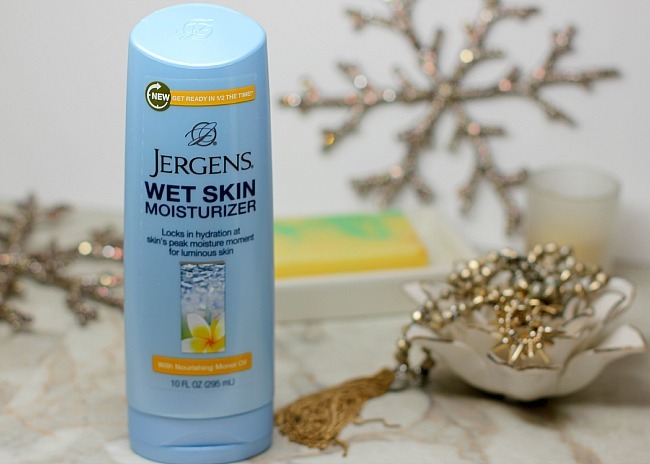 While I was compensated to write a post about Jergens Wet Skin Moisturizer, all opinions are my own"
i love this time of year. seriously, i just can't get enough. the cooler temperatures, the cozy scarves, fireplaces, twinkling lights - all of it makes me smile. the one thing i don't love about this time of year? the havoc it wreaks on my skin. the cold temperatures mixed mixed with arid indoor central heating leaves my skin dry, itchy and irritated. it is not unusual for me to keep bottles of lotions stashed everywhere around me house. i keep one near every sink, inside most drawers and within arms reach. for years my best advice has been to apply lotion IMMEDIATELY after bathing. your skin is most absorbent when it is moist and applying the lotion quickly after waking helps lock in the moisture. thankfully, JERGENS® has made a moisturizer specifically designed for that. the new JERGENS® Wet Skin Moisturizer is a revolutionary new formula that is designed to be applied to wet skin before you dry off. wet skin naturally soaks in moisture faster and with this lotion you can lock in all the moisture. as soon as you turn off the water from the shower, apply it directly onto your wet skin. the proprietary formula binds oil to the water on your wet skin to instantly lock in moisture. then, simply pat dry with your towel as you normally would & you’re ready to go! the moisture stays right on your skin where you want it. because you don't have to towel dry prior to applying you actually save yourself a little bit of time and for me, time is like a toddler in a tiara - precious and short. the skincare innovators at JERGENS® have designed JERGENS® Wet Skin Moisturizer specifically for use on wet skin. 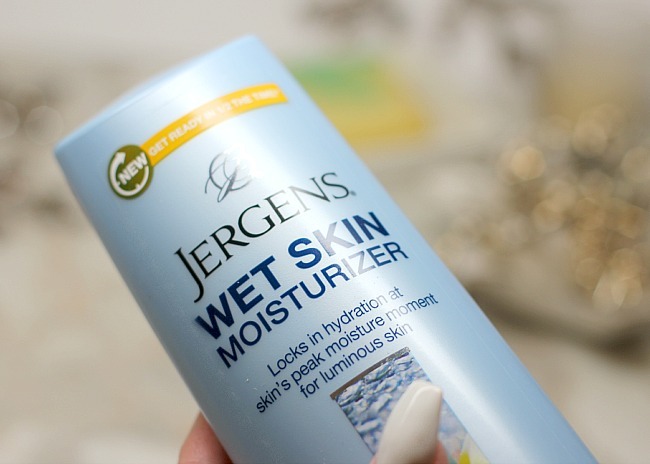 JERGENS® Wet Skin Moisturizer has received numerous beauty awards, touted as “breakthrough” and “genius” among the many endorsements JERGENS® Wet Skin Moisturizer is specially designed to lock in hydration at skin’s peak moisture moment for luminous skin. for a limited timed you can get $2.00 off any one 10 fl. oz. JERGENS® Wet Skin Moisturizer. choose from Refreshing Coconut Oil, Calming Green Tea Oil and Nourishing Monoi Oil. click here for the coupon. don't wait because this offer is on a first come first served basis. keep your skin luminous to match your personality and your wardrobe!